I went back and forth a bit about whether I should share this one with you guys because it is such a simple meal. Then I decided that this is the exact reason why I should share it. Who doesn’t want a 30 minute meal that is just as appropriate for company as it is for any regular weeknight? I threw this one together for a Sunday night supper date with a good friend last week. She suggested pasta and I instantly remembered I had been craving tortellini. I find that stuffed pastas can be too rich being covered in a creamy sauce; I prefer to do herbs and an olive oil drizzle instead. 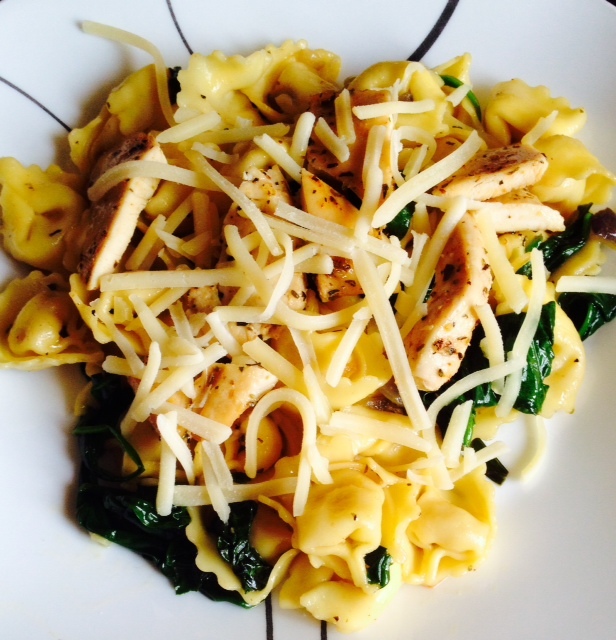 I sauteed onions and garlic in olive oil, wilted in some spinach and tossed the tortellini in that. I also made a super flavorful chicken and when I saw all those fabulous drippings in the bottom of the pan, I drizzled them over the entire dish. Flavor city. The next day for lunch, I tossed the cold leftovers with fresh spinach and sundried tomato vinaigrette for a cold pasta salad. This was equally delicious. Easy supper that doubles as easy lunch? This one deserves to be made this week. Preheat oven to 400 degrees. Line a cookie sheet with tin foil and brush it with a tablespoon of olive oil. Lay chicken pieces down and sprinkle each with half the seasoning salt, half the oregano and half the basil. Put a teaspoon of butter on each chicken breast and then sprinkle each with a tablespoon of brown sugar. Bake for ten minutes and flip, brushing with the pan juices and topping with the remaining seasoning salt, oregano and basil. Bake for another 10 minutes or until cooked through. Set the pan of chicken aside until ready to plate. While chicken is baking, bring a large pot of salted water to boil and cook tortellini according to package directions. While tortellini boils, put 2 tablespoons olive oil, onions and garlic in a large skillet over medium heat. Saute until fragrant, stirring frequently. Add spinach and stir until wilted. Turn heat to low. Drain and add tortellini to skillet; drizzle with chicken pan drippings. Stir together until coated. Place tortellini and spinach mixture on a plate. Top with sliced chicken breast and sprinkle with shredded cheese.